It's amazing how peaceful one can feel while holding a small smooth stone. Visually, the natural colors and markings evoke calm and a sense of being outdoors—something many people find therapeutic. Psychiatrist/Psychologist Office - Patients in therapy benefit from all kinds of tools, and sometimes the simplest thing has the greatest effect. 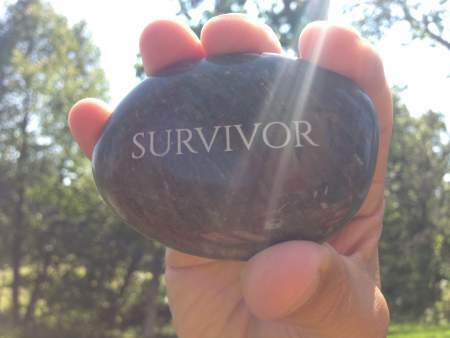 Mental health professionals can offer stones with words to remind patients of certain behaviors, or ideas and words to focus on during difficult moments. Hospice - Patients and their families will appreciate something to hold, read and keep from the hospice experience. Keep an assortment of stones with words like “Peace,” “Remember” and “Courage” for selection, and know that the meaningful service you provide will be remembered for years to come. Treatment Centers - Bring a little bit of nature into clinical settings with inspirational stones featuring calming messages and images. This is a simple way to create warmth in places that can't have plants and animals around. Crisis Centers - Give people something solid to hold on to when they're going through challenges. Placed within reach, engraved stones with words of hope and images can provide comfort and encouragement when they're needed most. AA - In addition to engraved stones with the Serenity Prayer, we can create stones featuring the principles of a specific program. Bring stones to an AA meeting to comfort an individual or several people, or offer them upon joining the group. Worry Stones - Physical movement can actually take our minds off the things that bother us, such as illness, work, relationship trouble or legal issues. Custom engraved worry stones are hand-held, and smooth enough to be rubbed between the fingers as a calming, quiet activity. Donor Giveaways - Finding a way to recognize significant donations to a good cause can be challenging. 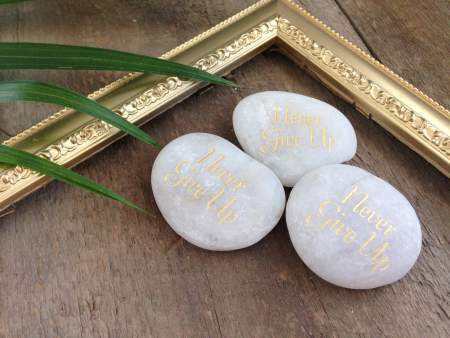 Give donors inspirational stones that will stay with them forever, and that carry a message with literal weight. Loss of Pet - It’s never easy to see someone lose a pet. If you run a veterinary office, consider keeping comforting, inspirational stones on hand for those going through the loss of their cat, dog or other fur-baby. These could bear a meaningful saying or symbol, or you could engrave them as a personalized memorial. Symbol Stones - There is truth to the saying that an image is worth a thousand words. If you run a crisis or counseling center, do a little research into comforting symbols for inspirational stones. They could be Chinese characters, Celtic knots, religious symbols or even simple pictures of animals. Memorial Stones - When a loved one passes, offer small memorial stones to those attending the funeral, visitation or other services. Simply engraving the name and lifespan of the loved one, or their favorite quote is a way to keep a feeling of connection. Talking Stones - Useful in therapy sessions, talking stones are used to ensure only one person speaks at a time. Engrave yours with a particular word or image that will encourage participants to open up and speak with confidence. In fact, you could even call them courage stones instead of just talking stones! Meditative Exercise - Simply holding a smooth stone can be meditative. Some people like to stack inspirational stones, making a meditation out of the balancing act. Whatever works best in your setting, our engraved stones will be the perfect tools for it. Religious Stones - For some, nothing is more comforting than their faith. If you manage a crisis or counseling center, even if you are not affiliated with any one faith, it may be nice to keep a few religious stones mixed in with other pocket stones. Homeless Shelters - Stones with words can serve as a source of inspiration for people who have minimal support in their lives. Place these around facilities for those without homes to create a warmer and more positive atmosphere. From serenity stones to courage stones with earth tones and smooth surfaces, these items can offer a welcomed distraction or tool for meditation during challenging times. Give them to the people in your life who need some comfort right now.